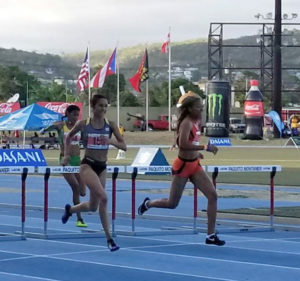 On Saturday evening in Ponce, Puerto Rico, Deya Erickson, a Turabo University sophomore won the Liga Atletica Interuniversitaria Justas 100m hurdles, becoming the territory’s first athlete to claim a title in the championships. Erickson missed the entire 2017 season, after severely injuring her knee days before her final Carifta Games in 2016. She had surgery six months later and was told she might never be able to run again. It wasn’t until last summer that she was able to do dynamic exercises and began running in October, after Hurricane Irma. Erickson’s remarkable comeback was fueled by the fact she was told she wouldn’t be able to run again. 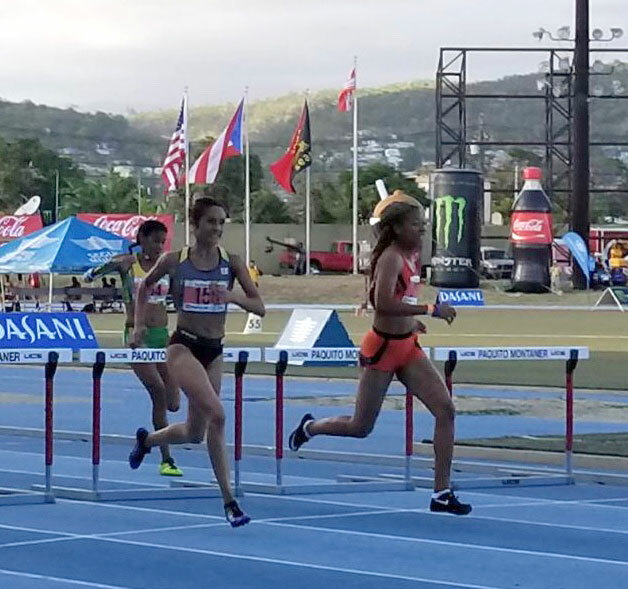 Erickson, who had the second fastest time of 14.31 seconds in winning her heat to advance to the final, fended off UPR Humacao’s Erika Serrano in a photo finish by .009 seconds as both ran 14.13. After opening her season with 14.71 seconds, running 14.31 in the semis Erickson said, that season’s best alone was motivation for her going into the final, after not racing in two years. She endured a lot to get within .03 of her BVI national record of 14.09 seconds in the final. Erickson said it’s a good feeling becoming the first BVI athlete to claim a Justas title. Elsewhere, at the Ashland Alumni Open, in Ashland, Ohio, Tynelle Gumbs was second in the hammer throw with a heave of 59.22-meters (194’3½”). She tossed the discus 44.28m (145’3¼”) and placed seventh. Twin sister Trevia, was seventh in the shot put after settling for 14.31m (46’11½”). Clemson sophomore Lakeisha “Mimi” Warner, was eight overall in the Penn Relays women’s 400m hurdles in 1 minute 00.54 seconds. She anchored her team’s 4×100-meters shuttle hurdles relay to fourth place overall in 56.57 seconds, then followed up with another anchor leg on the fourth placing 4x400m relay, that ran 3 minutes 41.21 seconds to win its heat. Iowa Central College freshman Akeem Bradshaw, was 12th in the Drake Relays Long Jump in Des Moines, Iowa, with a second round leap of 6.86m (22’6¼”). ASA College (Miami) sophomore Ronique Todman, got home in sixth place with a 400m season’s best of 48.37 seconds, in the Pure Athletics NTC Spring Invitational in Clermont, Florida, where three BVI athletes saw action. He was fourth in his 200m heat in 21.53 seconds. Teammate Kala Penn, returning from injury, was third in the women’s long jump with a 6.01m (19’8½”) measurement, before winning the triple jump with 12.21m (40’0¾”) effort. Shaquoy Stephens ran 10.97 seconds for seventh place in his 100m heat and season debut. Husson University freshman Kyantai Blyden, used a leap of 1.93m (6’4”) to win the Division III North Atlantic Conference High Jump title. He was sixth in the triple jump with 11.81m (39’9”) and scored 11 points in helping Husson to its first conference crown. The basketball player who took up track after basketball season ended, was seventh in the long jump after cutting the sand at 6.01m (19’8½”). At the high school level, Timber Creek High School sophomore Xiomara “Gia” Malone, advanced to the Florida Outdoor Track and Field State finals in the high jump, after ending in a four way tie in the Class 4A Region 1 meet in Bunnell, Florida. She will compete in state after clearing the bar at 1.60m (5’3”). Malone placed 12th in the long jump with a distance of 4.93m (16’2”). She was third in her 100m hurdles heat in 15.16 seconds, but did not advance after finishing sixth overall. Contributing a third leg carry, Trent Herbert helped his St. Vincent Pallotti High School to a division victory in the 4x400m relay at the Penn Relays Carnival on Saturday, in 3 minutes 27.27 seconds. In middle school action, despite a slight injury, Adaejah Hodge showed her competitive mettle in the Douglas County Middle Schools Track and Field Championships in Atlanta, Georgia, by winning the 400m in 59.35 seconds. She was third in the Triple Jump with a 9.37-meters (30’9″) leap and seventh in the 100m in 13.55 seconds. At the Matrix Invitational in Tampa, Florida, Ayana Findlay pulled out victories in the High Jump with a leap of 1.37m (4’6”), the 200m in 26.80 seconds then finished second in the 400m with a time of 1:02.67.